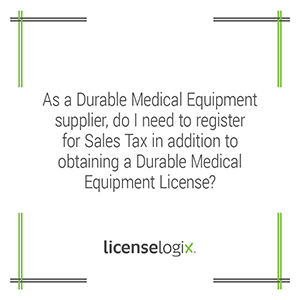 Many states do require DME suppliers to register for sales tax even though, very often, durable medical equipment is exempt from sales tax. If you are unsure of whether a particular jurisdiction requires you to obtain a Sales Tax ID, please feel free to contact us! Overview The licensing requirements for suppliers of Durable Medical Equipment (“DME”) or Home Medical Equipment (“HME”) vary across all jurisdictions in the United States. Given that the term DME covers such a wide array of devices, it is not always clear which licenses, if any, a provider may need in order to distribute in any given state. Furthermore, the term “supplier” or “provider” includes DME companies, home health agencies, physicians, and other practitioners. Often, each state varies on which suppliers may or may not be exempt from DME licensing requirements. Generally, approximately 25 jurisdictions issue Durable Medical Equipment licenses at the state level. However, just because a DME License exists in a state, it doesn’t mean that every DME supplier needs to be licensed. This must be determined on a case-by-case basis, dependent upon what type of equipment is being dispensed, by whom, and to whom. Once it has been determine that a license is, in fact, required, the process typically requires a lengthy application, a fee ranging from $100 to $1,000, extensive supporting documentation, and renewals. Licenses are generally issued by the State Board of Pharmacy of Department of Health. Processing times can be as long as 9 months due to the inspection requirements implemented by the majority of states that license DME providers. With respect to Durable Medical Equipment providers, states also tend to differs on whether a Pharmacy License or a Sales Tax ID is required. A pharmacy license may be required if the equipment falls under a state’s definition of pharmaceuticals. A Sales Tax ID or a Sales Tax Exemption may be required depending on the types of equipment that fall under a state’s exemption laws. Even for a jurisdiction that does not issue DME Licenses at the state level, the possibility of these other types of licensing requirements should be considered. A company providing Durable/Home Medical Equipment without proper licensure may be subject to civil and criminal penalties. Companies must be particularly careful to ensure that their employees are properly licensed if they are going to be setting up or installing any of the equipment being provided. In many cases, companies have incurred heavy fines as a result of unlicensed employees. How we help your business: 1) We stay up-to-date with changing requirements and forms so you can focus on the job at hand. 2) We complete license applications efficiently and correctly, allowing your in-house staff to save valuable time struggling to obtain the proper licenses. 3) Once your license has been issued, we ensure that you remain compliant with all licensing laws.